Discover the fascinating world of music with CASIO Mini Keyboards! Stylish design, small keys, sound diversity and exciting features to make music even more fun. Unlock the joy of playing for young and old! CASIO has been one of the loading producers of electronic keyed instruments for years. Digital pianos and keyboards by CASIO are popular among the most diverse musicians and performance artists. Professional musicians making live appearances love CASIO keyboards as much as amateurs, composers, and beginners. CASIO keyboards are particularly popular among the latter category as there are so many keyboards targeted to them. There are also standard and lighted key keyboards, as well as CASIO mini keyboards. With these, CASIO is targeting young musicians. Children who want to learn a keyed instrument will find the ideal companion for their first steps into the world of music in a mini keyboard. Unlike the instruments in the standard, arranger, high grade, or lighted key categories at CASIO, which have 61 keys, mini keyboards have 32 key or 44 key keyboards. The keys are small and child-friendly, small enough to let kids practise with ease. CASIO mini keyboards let children experience the joy of learning a musical instrument without being overwhelmed. 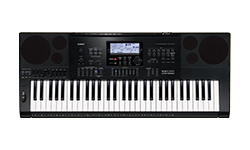 At CASIO Music, you will find an overview of mini keyboards with all the details, features, and technical details for CASIO keyboards for children. You will also see our CASIO retailer search, where you can try out a mini keyboard for yourself. CASIO children’s keyboards have a large output and can withstand a lot - a necessity, since children put a lot of pressure on a keyed instrument when first starting out. Above all, a child should enjoy learning and playing an instrument for a long time. They are especially light, transportable, and, thanks to being powered on 6 x AAA batteries, can also be used anywhere. Let your children play where they like and impress their parents with the pieces they have learned. Although mini keyboards from CASIO are designed for kids, with their small keys, they are not a toy. A mini keyboard is a fully-fledged keyed instrument that is even used onstage by some professional musicians for special effects. For sound generation and features, the kids’ keyboards hold their own. They come with an 8-note polyphony and offer 50 tones and 50 different rhythms. For child-friendly practising, CASIO mini keyboards come with an integrated song bank with 10 practice pieces. With the help of the Melody Off practice system, the melody voice can also be switched off so that the student can play independently and tune their ear. In order to brighten up play, the CASIO mini keyboard has various additional features, just like its big brother. 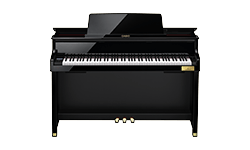 With the touch of a button, you can switch between piano and organ setting. There are also 5 drum pads buttons, allowing you to add different percussive sounds and giving an introduction to the world of drum machines. There is an LCD integrated in between the keys, indicating which function is currently activated. With the selection of mini keyboards shown here, CASIO delivers the perfect practice instruments for budding musicians. Discover the functions and possibilities of modern kids’ keyboards or try out a current model for yourself or your child at a local retailer.